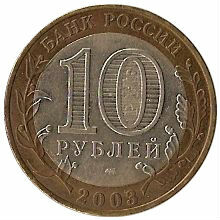 In the centre - the indication of the face value of the coin "10 РУБЛЕЙ" (10 RUBLES). Inside of the figure "0" - hidden pictures of the figure "10" and of the inscription "РУБ" (RUB) visible by turns only on changing the angle of vision. In the lower part of the disc - the mint trade mark. 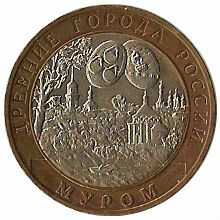 In the upper part of the ring - the inscription along the rim: "БАНК РОССИИ" (BANK OF RUSSIA), in the lower one - the year of issue "2003", to the left and to the right - stylised twigs of plants going over to the disc. The image of churches among trees, above them - two coats of arms of Murom, in the foreground - a river and a fisherman in a boat. The inscriptions along the rim: at the top - "ДРЕВНИЕ ГОРОДА РОССИИ" (ANCIENT RUSSIAN TOWNS), at the bottom - "МУРОМ" (MUROM).